Welcome to my Booklikes blog. I remember when I first saw Stitch, Book I of the Stitch Trilogy by Samantha Durante. I had to have it! I fell in love with the story and the characters and have patiently waited as each book became available, then devoured it. The Engineers manufactured world is the total opposite of the dystopian world of poverty and desolation the rebels live in. Myself, I love rooting for the underdog and the rebels need my help. Here I come guys. And the monsters were born! Extermination, extinction, a virus, the end of the world, a man-made apocalypse, secrets, unlikely allies, and a very special girl. This is one of those books that gets my motor running into overdrive. The elite feel they are the be all end all and to hell with everybody else. OMG! I knew the evil bastards would do something, but I didn’t see that coming. Could it be true? The writing of the trilogy took place over a five year time span. I think it would have been better if I went back and read the series from the beginning and I will be doing that some time. I have a feeling it will change my rating. That being said, once the previous books began to come to mind, I was able to bring myself up to date. The story became intense and I was happy to add Alex and Deion to my group of friends. I found it easy to get lost in their world, their struggles, their regrets, loss, hope and love. the writing made the story unfold as if I was watching it on the big screen. As Samantha Durante brings the trilogy to a close, it brought tears to my eyes. I felt happy with the characters endings. BUT, man oh man, Joe…well, I saw that , and Lizzie, oh Lizzie…I can’t tell you any more without ruining it for you. If you love having your emotions ramped up to a fever pitch, if you love white knuckled reading, if you love apocalyptic/dystopian novels and are looking for an original storyline, you may want to grab the Stitch trilogy. 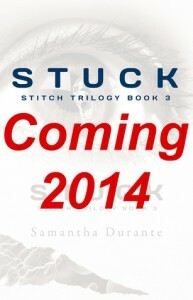 I voluntarily reviewed a free copy of Stuck by Samantha Durante.